When you are venturing into a business, there are a ton of risks that come with it. As a responsible business owner, you want to make sure that you are able to protect your business. You can do this through agreements. Agreements are quite common in businesses and one agreement that plays an important role for certain businesses is the indemnity agreement. If you are a new business owner and you are looking to know more about indemnity agreements, we are here to share a couple of basic information about indemnity agreements. 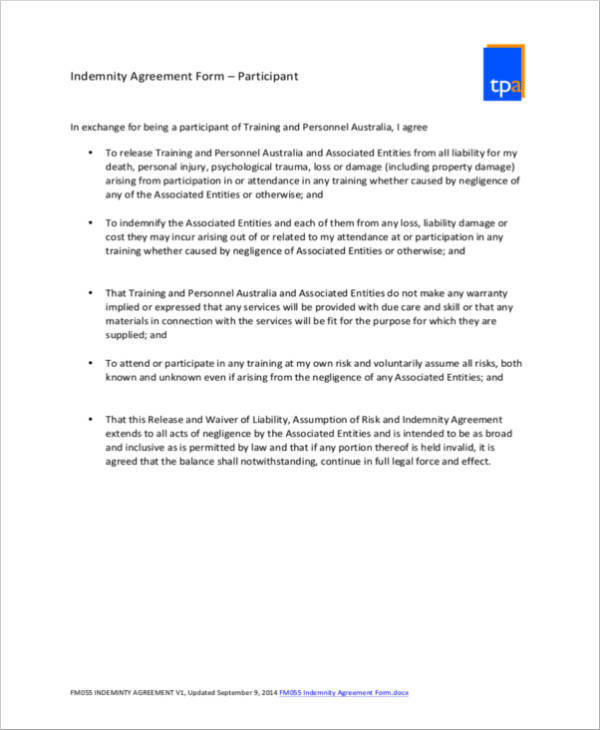 We would also share some sample indemnity agreement templates that you can easily download from this article. If you are ready to know more about indemnity agreement examples, check it all out scrolling down. Indemnity is basically an individual or entity’s protection or security against any type of loss or financial burden. 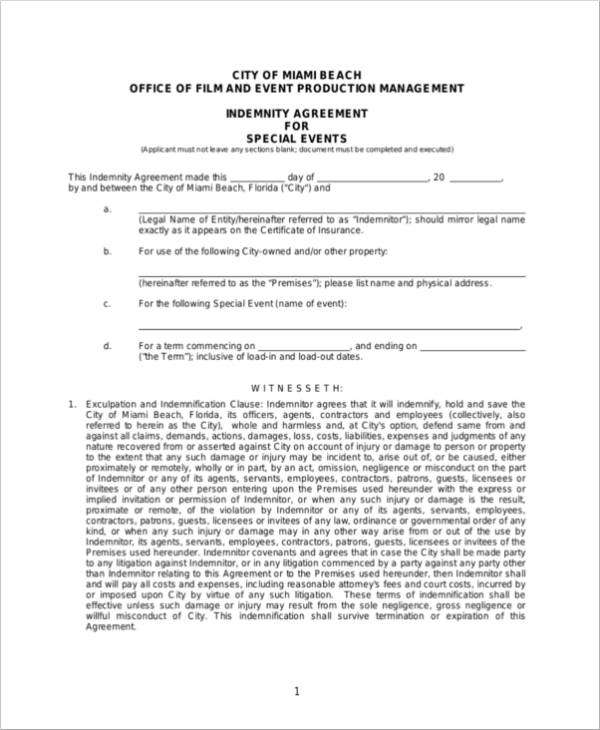 To put it simply, an indemnity agreement is a written documentation that helps businesses or individuals involved with the agreement to be properly compensated for any financial loss or damage. 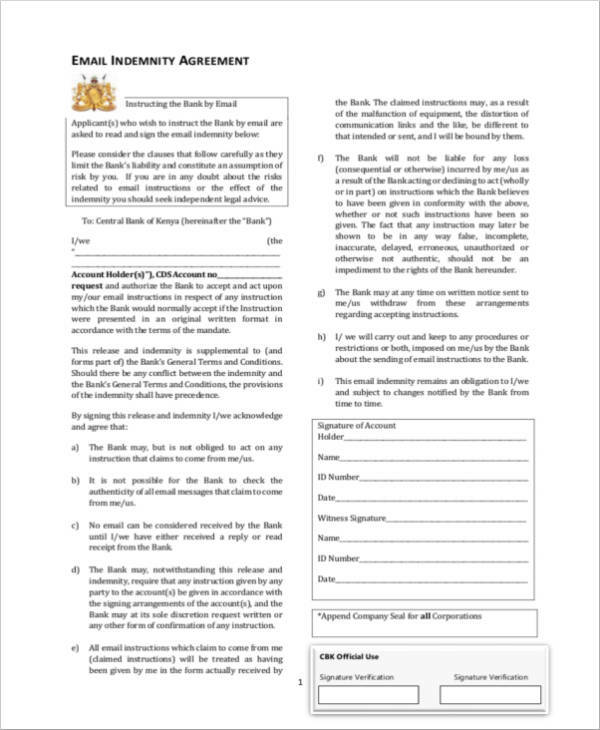 you may also see Financial Confidentiality Agreements. 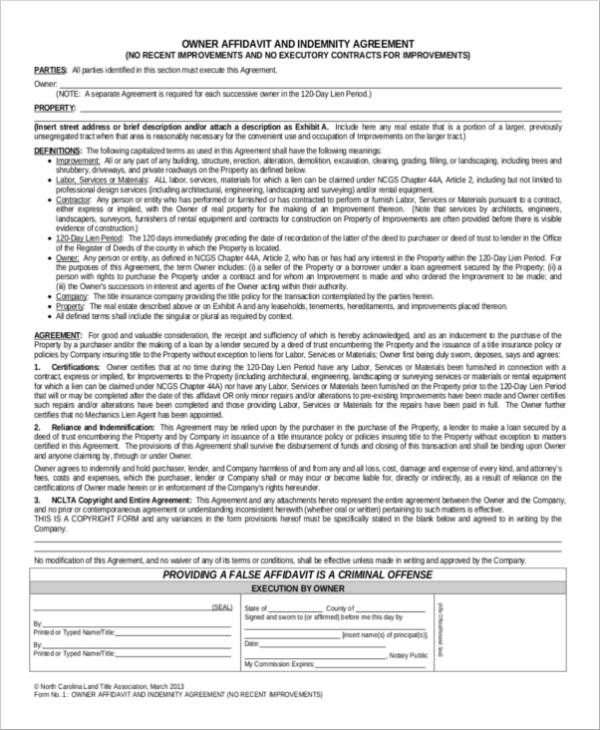 How your indemnity agreement will look like depends on the state laws present in the state you are currently in. However, we would like to give you a good overview of what you will commonly find in an indemnity agreement contract. First and foremost, you will find the parties involved. The Indemnitee or the party or individual who is seeking for protection. The Indemnifier or the person who is promising or giving a warranty that there will be zero to minimal harm done to the indemnitee. You will also find in an indemnity agreement a consideration that will be used as a means of securing the agreement. Typically, this will be in the form of a fixed amount of money. You will also be able to find exclusions in the agreement. Typically, the exclusion will state anything regarding the negligence or the fault of the indemnitee. 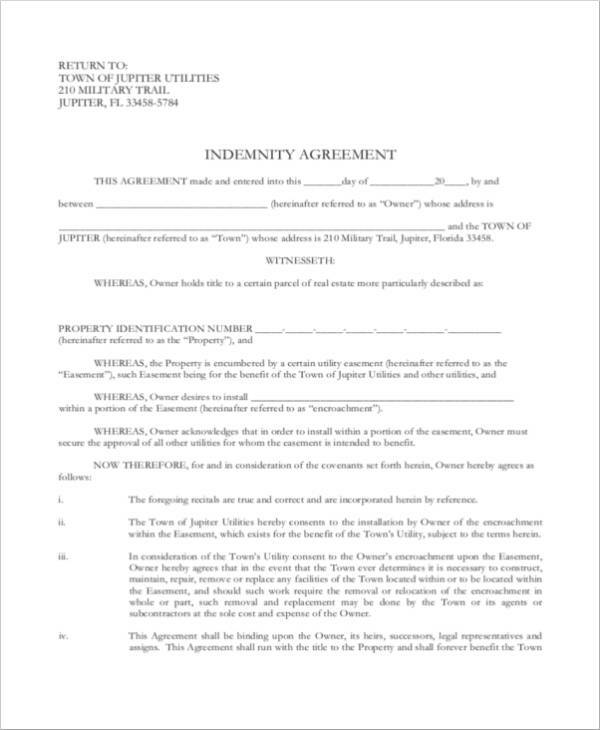 This means that if the indemnitee is proven to be negligent in any agreement form regarding his/her responsibilities stated in the agreement, the indemnity agreement will be considered null and void. In worst cases, the indemnitee can be sued. A description of the claims process will also be commonly found in an indemnity agreement. This will include when a claim can be filed as well as the limitations regarding the claims. It will also define how an indemnifier can prove claims are not appropriate. 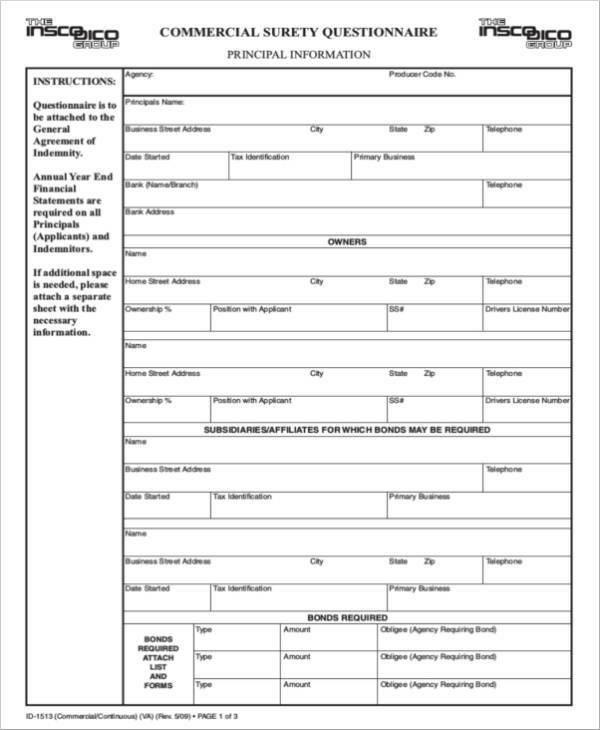 you may also see claim form. Basically, everything that has been mentioned in this section is what you can typically find in an indemnity agreement. 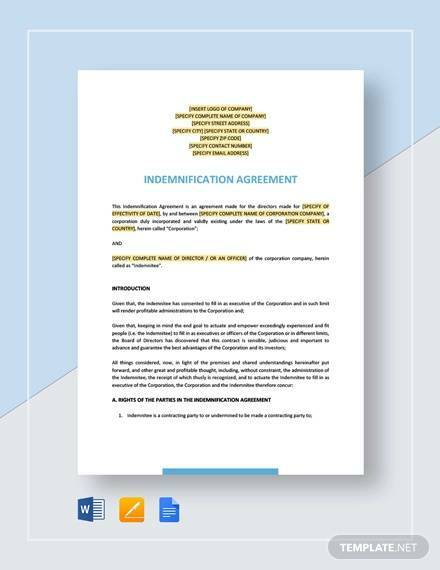 If you need more information about what you can include in an indemnity agreement, you may want to check out Sample Hold Harmless Agreement Templates. 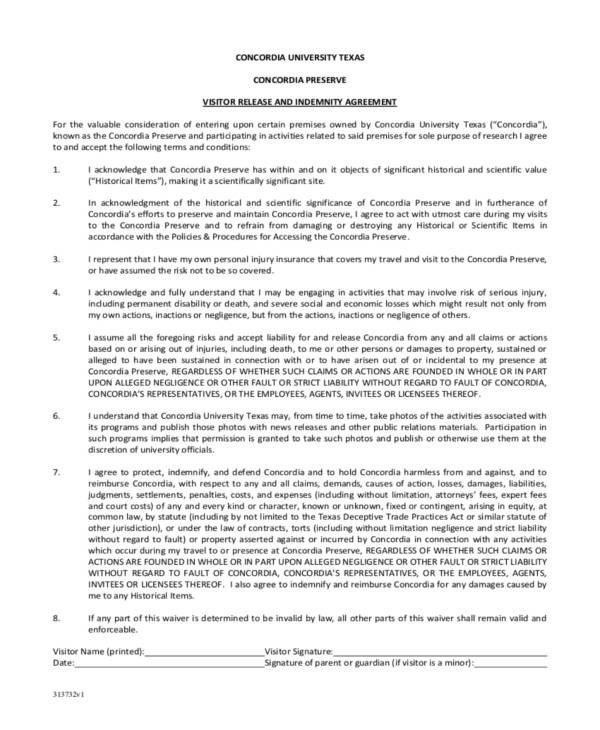 This type of indemnity agreement sample is based on a common law principle wherein it will state that negligence will be based on the actions that a party supposedly has complete control of. These types of indemnity agreements will typically state that the subcontractor will pay for all of the damages that will be made by the subcontractor should the said subcontractor commit any negligence. 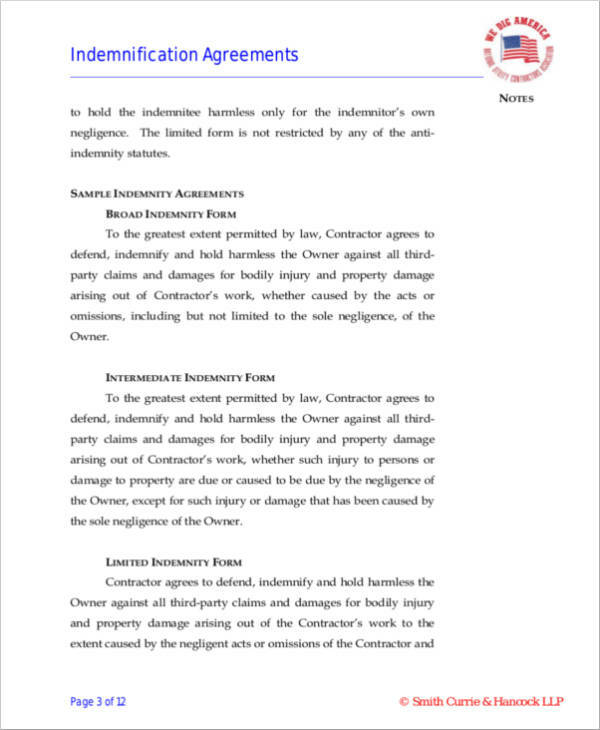 This type of indemnity agreement basically puts a very heavy burden upon the subcontractor, which means that subcontractors should be careful with their actions should they be involved with this type of indemnity agreement. This type of indemnity agreement is also known as no-fault agreements. 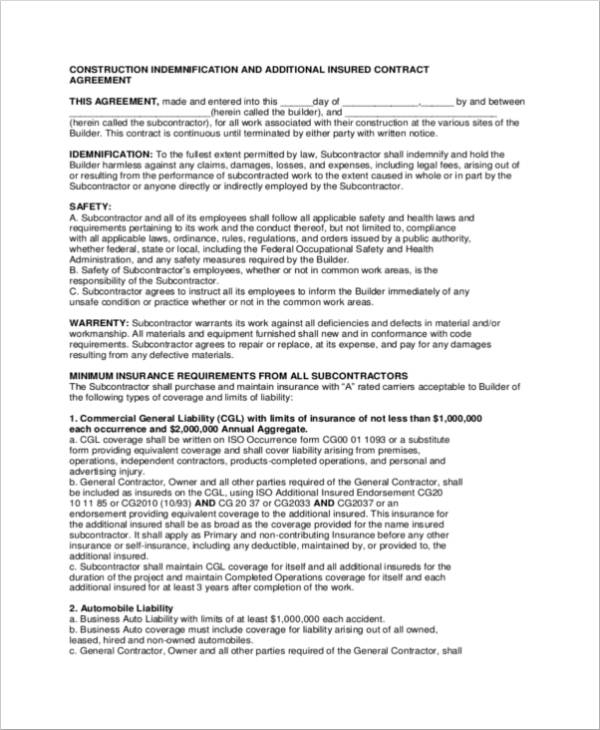 This type of indemnity agreement places the loss on subcontractors. Before coming up with this type of indemnity agreements, you want to make sure that you check with your state first as many states have discouraged and considered this form of indemnity agreement as illegal. This is because the terms and conditions are deemed to be unfair to the sub-contractor agreement. Before an obligee can get a surety bond, an indemnity agreement is needed to be signed first. 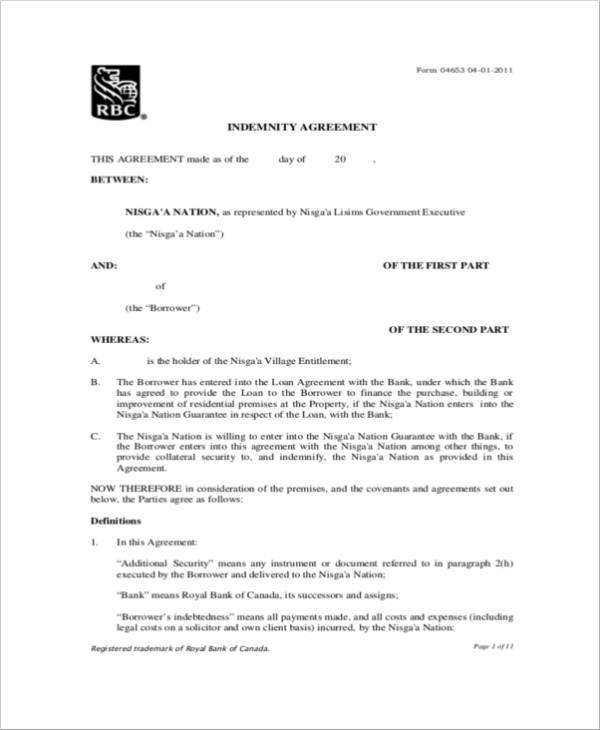 This will help to protect the company from any neglect done by the obligees regarding his/her obligations toward the surety bond as stated in the agreement. It can also help to protect the company toward any loss that may arise due to the surety bond. 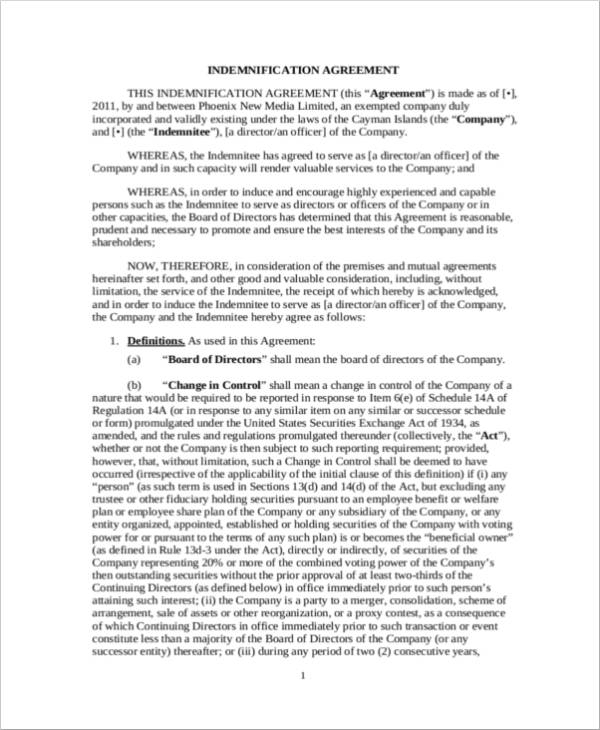 you may also see Company Contract Agreements. 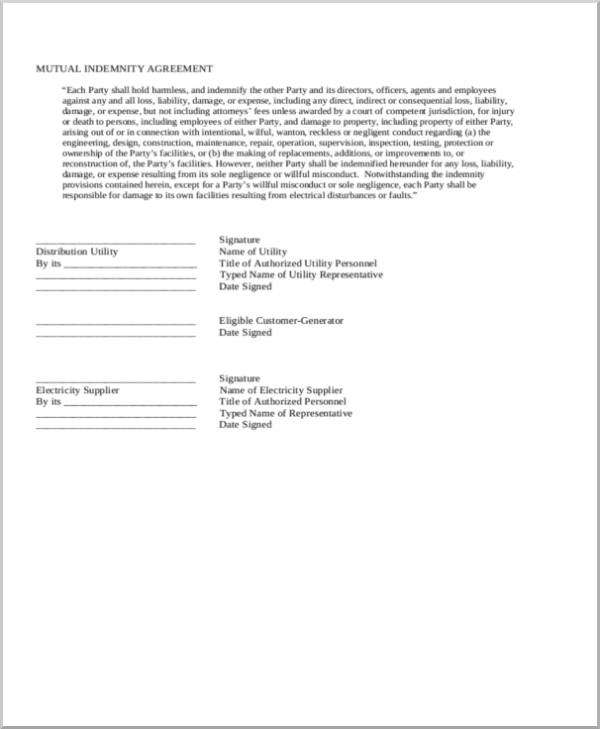 Indemnity agreements are used by rent-a-car companies by having the drivers sign said rent agreement before they allow the driver to drive the car away from the lot. This helps to protect the company from any legal claims and lawsuits should the driver or the person who rented the car get in an accident while driving the rented car. Pet hotels or kennels will need to have the pet owners sign an indemnity agreement before they allow the pets to be boarded overnight or for a couple of nights. This will state the pet kennel or pet hotel will not be liable for any harm caused by other pets toward the pet owner’s pet. This helps to protect the pet kennel or pet hotel from any possible lawsuit taken against them. Before a property owner hands over the keys to the new tenant, he/she might need to ask the tenant to sign an indemnity agreement or an indemnity clause stated in the lease agreement. The indemnity agreement for rental properties will help to protect the property owner from loss or damages that may be caused by the tenant to the property. There are a couple of things that you should consider before you sign an indemnity agreement or any type of agreement. Check out this list that we have below. 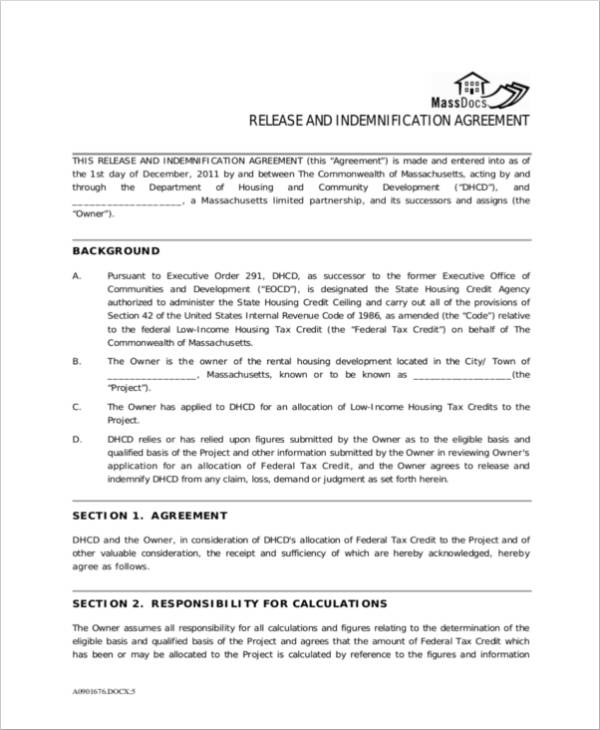 Make sure that you are not going to just sign the agreement without reading it beforehand. You want to make sure that you understand everything that is stipulated in the agreement and that you agree with what is written. 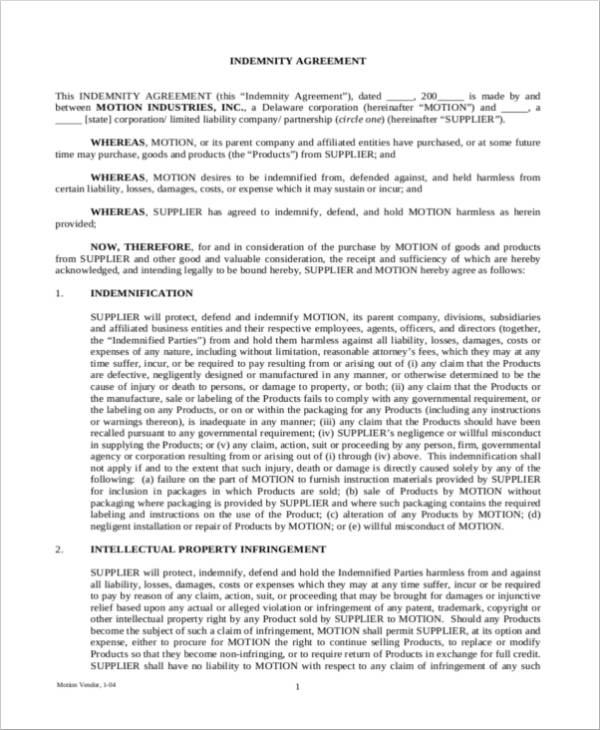 You do not want to just sign and be clueless about the contents of the sample agreement. You want to make sure that you ask an attorney or a paralegal to review the agreement. This way, you are sure that everything is legal and that there are no to minimal loopholes in the agreement. Should there be any discrepancies or you find any clauses or terms and conditions questionable, do not hesitate to get in touch with the other party. 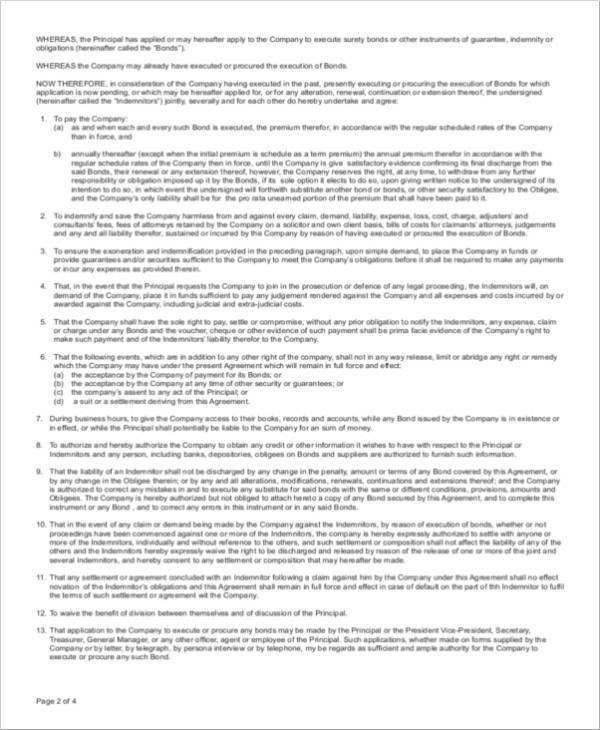 If you see that there are any discrepancies yet you still want to push through with signing the agreement, make sure that you know the consequences of doing so. Remember that you are also liable because you opted to sign despite the discrepancies. If there is anything that you find confusing or need more help with, do not hesitate to get any legal advice. This way, you are less likely to get yourself into trouble. Better pay for a good legal service than pay hundreds to thousands of dollars for litigation costs or damages. 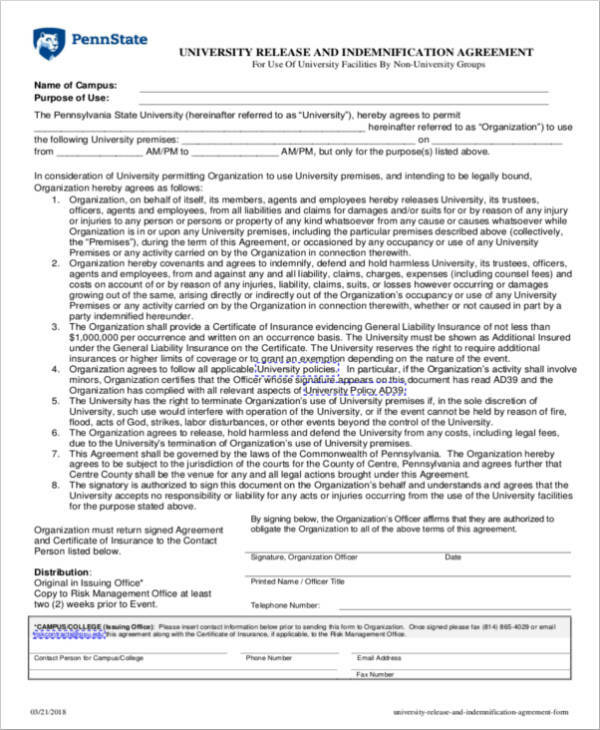 you may also see service agreement. Now that you know a little bit more about indemnity agreements, you can now get a head start on your own indemnity agreement. You can check out the simple agreement examples we have uploaded and use it as a reference for making your own indemnity agreement.